The Mickelberg brothers have claimed all along that they were framed. The most damning evidence was the 1982 unsigned confession of Peter Mickelberg, made without witnesses or legal representation. The Mickelbergs claimed they'd been "verballed" - the process by which a confession is written and then presented as a true account of a police interview. In 2002, one of the senior detectives has come forward and acknowledged that the "confession" was indeed fabricated. Police in Australia can no longer submit unsigned confessions into court and videotaping of interviews is now a requirement - largely as a result of this case. This page is not intended to suggest whether or not the accused perpetrated the crime, but rather to allow interested people to assess the nature of the evidence for themselves. What follows are some of the exhibits called into question from the original trials and subsequent appeals. 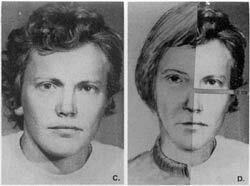 The passport photo of Peter (A) that was later used to create an identikit with wig and glasses and the first police 'impression' of a suspect in the swindle (B), issued to newspapers four days after the swindle. The passport photo (C) printed in reverse bares an uncanny likeness to the freehand police sketch, particularly noting peculiarities of the nostrils, angle of the eyes and the mouth. Shading has an eerie likeness, as does the hairline and neckline. When the two halves are joined (with a small cut to allow for a slight elongation of the distance between the nose and eyes) the image is almost that of a mirror (D). 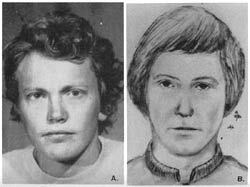 The witnesses who described the suspect in such detail as to cause the police sketch - not identikit - to be done with such precise imagery, failed to describe to the artist the main variation between Peter's passport photo and his normal facial detail: his prominent, almost buck teeth. Fingerprint - For Real or Forgery? This signature is each man's very own. There is no duplicate of it among the swarming populations of the globe!" Of course, that was before the advent of silicon. 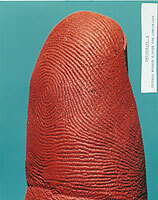 It is now becoming more widely acknowledged that fingerprints can, in fact, be forged. Experts from Scotland Yard, the F.B.I. and the U.S. Secret Service testified to the validity of a fingerprint presented as evidence. Could a fingerprint be faked? 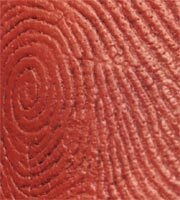 US Court Restricts Fingerprint Testimony. A federal judge has ruled that fingerprint experts should not be permitted to tell juries that two fingerprints are a "match," because the science they rely on doesn't meet the U.S. Supreme Court's Daubert test for assessing reliability of scientific evidence. In United States v. Plaza Senior U.S. District Judge Louis H. Pollak in Philadelphia stopped short of throwing out all fingerprint testimony, saying such a ruling would be "unwarrantably heavy-handed." The ruling may ultimately flow through to the presentation of DNA and other forensic evidence. (Law News Network, January 9, 2002). This enlargement of a rubber cast of Raymond Mickelberg's right forefinger clearly shows that even the finest details down to sweat pores were reproduced by the casting. 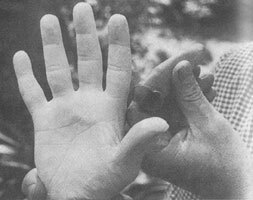 The method: a latex rubber glove was first made, illustrated by the digit held here, into which the silicone was poured. When dry, hands of intricate detail were produced by Raymond Mickelberg. Casts of hands such as these were acknowledged by police to have been in their possession before the alleged crime mark was 'discovered' and found to match Rays' own. The original evidence was destroyed in suspect circumstances. As the crown prosecutor stated to the jury in 1983, "The system under which we operate is that at some stage the police deliver to the defense the so-called hand-up brief. That is the statement of all of the evidence of all the witnesses, the people from the mint and all the police officers." This certainly should be the case, but sadly was not so for the Mickelbergs. All mention of alternate suspects, witnesses supporting the accused men's alibis and any evidence not supporting the prosecution were simply eliminated, lost or destroyed. The books highlight the mass of evidence that was omitted from the hand-up brief, plus interviews with vital witnesses that the police never questioned, despite their obvious relevance. Yet more evidence was destroyed, fabricated and 'lost', as shown in "The Mickelberg Stitch", "Split Image" and the soon-to-be-revealed "Litany of Lies", by Avon Lovell.